We’d love your help. Let us know what’s wrong with this preview of Meet a Jerk, Get to Work, How to Write Villains and the Occasional Hero by Jaqueline Girdner. To ask other readers questions about Meet a Jerk, Get to Work, How to Write Villains and the Occasional Hero, please sign up. I got this little short story for free on Amazon kindle. It's basically a reprint of an article from some writing journal or other about where the author finds inspiration for the villains she then knocks off in her stories and the heinous circumstances of their deaths, but it is information I haven't encountered before and it's opened my eyes for a whole new avenue for creating mayhem in my own novels. Thanks for the freebie! I really liked the though processes behind the idea of this book. This is plot solver, or even story if you think about it hard enough. The basic idea thrown out in this little ebook by author Jaqi Girdner, is that there are Murders and Murder Victims for your story plots in everyday life. I'll give an example. Say that someone cuts you off badly in heavy traffic. That someone's an butthead, and now your murder victim. That's it in a very basic way, but you can take it further. Bullys, generic je I really liked the though processes behind the idea of this book. This is plot solver, or even story if you think about it hard enough. The basic idea thrown out in this little ebook by author Jaqi Girdner, is that there are Murders and Murder Victims for your story plots in everyday life. I'll give an example. Say that someone cuts you off badly in heavy traffic. That someone's an butthead, and now your murder victim. That's it in a very basic way, but you can take it further. Bullys, generic jerks you know in your life, or even something that's happened to friends or family when someone exclaims "I could have killed him!". Not a full length book...but an article. Very interesting. Finding villains in everyday life, even strangers on the street. A quick and useful read for beginning writers as well as veterans. It's one writers process on how she comes up with her characters and plot. It is not an in depth analysis of anything. Interesting look into the mind of a murder, oops. I mean writer. I'm not one for mystery novels but that doesn't mean it didn't teach me anything. Writers from all genres can take something from this piece and reengineer it for their desired genre. I'm surely am. I appreciated the tips on finding villains in your everyday life. Jaqueline Girdner introduced an interesting approach to finding murderers and their victims. The novel summed up to revenge killing. If you meet someone who is "unpleasant" or has wronged you or a friend in some way, they could easily be your inspiration for a bad guy. She offers some other insight to how she goes about plotting murders and finding murder weapons, I appreciate any published author's insight. 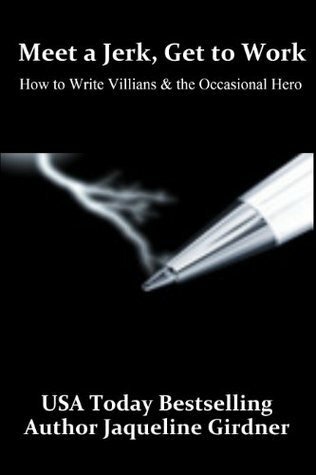 This was a free eBook, I appreciated the tips on finding villains in your everyday life. Jaqueline Girdner introduced an interesting approach to finding murderers and their victims. The novel summed up to revenge killing. If you meet someone who is "unpleasant" or has wronged you or a friend in some way, they could easily be your inspiration for a bad guy. She offers some other insight to how she goes about plotting murders and finding murder weapons, I appreciate any published author's insight. I simply adored this little article! I don't want to steal Ms Girdner's thunder, but it's basically about observation. It's about watching and listening to real people in real situations around you and drawing your inspiration from them, specifically to write murder mysteries, but really it's applicable to any genre. The article really gets the creative juices flowing. I might just consider writing a murder mystery at some point! Short and sweet - this is more of a blog post than a novel, but still quite a few helpful insights into the writing process. What makes a good motivation/murderer? What makes a good victim? What makes a good location/weapon? How can everyday experiences influence and inspire stories? This is a fairly short instructional book on how to write mystery novels. I found it simple but definitely worthwhile to read. A quick read with great tips. This is the second time I've read and I was able to glean magic from it both times. Good, but not what I was looking for. I thought this was going to be more on the lines of creating a good villain, but it was more along the lines of how the author found inspiration in the people and things around her. I enjoyed reading the author's way of finding and creating villains. It is short, but it gives you a way to approach writing in a villain. Has some good ideas to help a novice get started. Jaki Girdner lives, works, practices tai chi, and eats her vegetables in Marin County, California, along with her favourite computer peripheral, Famous Spouse Gregory Booi.